The Galapagos diving yacht Nortada will regularly offer 7 night itineraries to Wolf and Darwin. Some of the specialized products Nortada will offer to her clients include full rebreather and technical diving support, photo – video oriented departures, citizen science programs maintained in partnership by leading research institutions and private celebrity expeditions. High and Low season itinerary options are available. Panama or low season for departures starting January 1st to May 31st. Humboldt or high season for departures starting June 1st to January 31st. Humboldt and Panama seasons itinerary for Wolf - Darwin islands. Panama season alternate itinerary also available for western and central Islands with combined dives & naturalist land visits. The Galapagos M/Y NORTADA is a First Class Galapagos charter yacht. for our Galapagos diving liveaboards, we have all cabins with windows, air-conditioning and a private bathroom. The yacht features wide sun-decks, bar and comfortable dining / lounge areas. Gas Filling: Twin Nuvair HP compressors, one electric one Diesel; Nitrox / Trimix LP system features compressor, membrane and Helium intake. Redundant Oxygen Clean Haskell Sport Boosters. Portable Tri Hunter 3000 Gas mixing stick. Cylinders: 30 aluminum 80 cu ft / 12 liter cylinders, 15 for air and 15 for Nitrox; 15 aluminum 100 cu ft / 15 liter cylinders. All cylinders fitted with XS Scuba PRO DIN Insert valves. 10 nitrox compatible 40 cu ft / 6 liter aluminum bailout cylinders rigged as stage / sidemount. 20 steel 19 cu ft / 2 liter rebreather cylinders fitted with various valves. Gas Analysis: 02 Nuvair Nitrox analyzers. 01 Analytical Industries Trimix Analyzer. Diver safety: 10 Nautilus Lifeline bi-directional VHF/DSC marine radio with GPS; 10 Dive Alerts; 10 Reef hooks; 10 emergency strobes; 10 DSMB’s. Main Deck: Bridge, Galley, Air Conditioned Dining Room and Lounge. 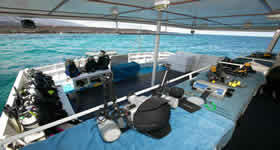 Dive platform with ample benches, outside showers, camera tables and rebreather rinsing facilities. Lower Deck: (4) fully air conditioned cabins with two single lower berths and one single upper berth. Each cabin has: private bathroom, lockers and drawers. Crew: Captain, Mechanic, Cook, Two sailors and one naturalist guide dive master all in separate accommodation. 24 mile range Furuno Navnet Radar/Chart Plotter, Furuno-FCV620 Eco sounder, GPS, Furuno NX300 Navtex, Furuno HF-MF/DSC Radio, VHF/DSC Icom radios, ACR Epirb, ACR Sart, ACR VHF bi directional rescue radio, Ritchie Magnetic Compass, hydraulic helm, barometer, clock, thermometer, helm indicator, searchlight, horn, fire & smoke detector system. (2) DSB inflatable life rafts for 16 passengers each, (16) life jackets, 17 feet Nautica Inflatable boat with 50 HP four stroke outboard engine for 10 divers. All safety equipment complies with International Coast Guard regulations. Tour does Not Include : *Flight ticket *$ 486.00 Quito/Galapagos/Quito *Galapagos National Park tax USD100 to be paid in cash upon arrival in Galapagos and INGALA tourism card USD10.00 *Extra drinks, personal spending and tips *Snorkel gear. International airfare. 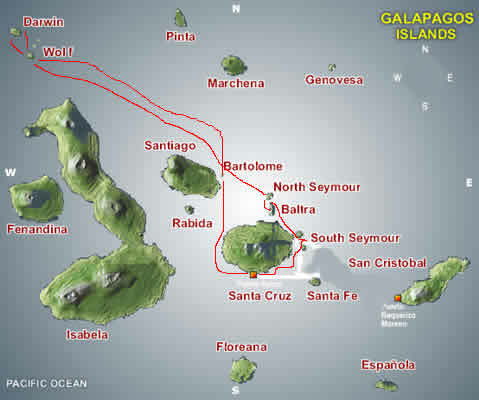 Galapagos flights. Travel cancellation insurance, which is strongly advised for all cruises. • Equipment rentals, • Nitrox refills. You must pay extra for these custom tank fills.• Premium imported alcoholic drinks, Crew tips. Once you flight in Baltra airport on Friday, a guide will greet you at airport & drive you to the boat. There is a check-out dive Friday afternoon near Punta Carrion, followed by a delicious dinner served by the onboard chef. Saturday morning the Nortada starts sailing to the first of many excellent dives sites. Divers are awakened by a home-cooked breakfast. June 1st to January 31st.